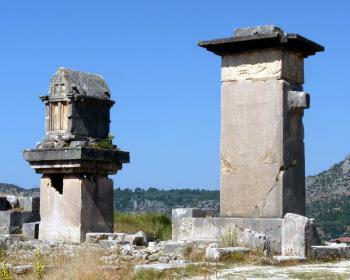 Xanthos-Letoon is an archeological site consisting of two separate locations that represent the Lycian civilization. Their art work is well known, e.g. the monumental tombs that were taken to the British Museum, the most famous being the Nereid Monument, the Harpy Monument and the Payava Sarcophagus. Xanthos was the name of a city in ancient Lycia. It was a center of culture and commerce for the Lycians. The archeological excavations at Xanthos have yielded many texts in Lycian and Greek, including several bilingual texts that are useful in the decipherment of Lycian. The sanctuary of Leto called the Letoon near Xanthos, was one of the most important religious centers of the Lycian region. The foundations of the Hellenistic temple dedicated to Leto, and her children, Artemis and Apollo, have been excavated. Archaeologists have excavated much of the ruins; discoveries include the Letoon trilingual, bearing inscriptions in Greek, Lycian and Aramaic, which has provided crucial keys in the deciphering of the Lycian language. Even today, the capital of Lycia gives you the impression that this was a civilisation that was able to do things on a grand scale. 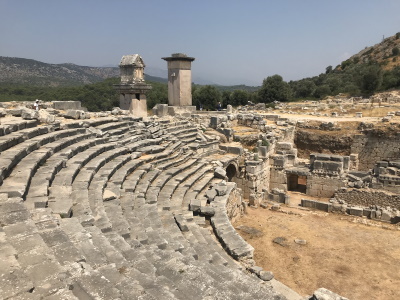 The twin sites of Xanthos and Letoon are only about 60 kilometres from Fethiye but are slightly tricky to get to if you don’t know what you’re doing. They are not an obvious stop for tourists passing through although tour buses of Turkish locals are more likely to stop there. It’s a pity, because both locations (which are about five kilometres apart and I easily walked between) have a lot to offer. Not only are they an interesting insight into the Lycian culture but also they show the influences that came from both the west and east. It seems somewhat surprising that, of all the “Classical” sites on or near the Turkish coastline the so-called “twin site” of Xanthos-Letoon should have been Turkey’s first choice for inscription way back in 1988. It was accompanied that same year by Hierapolis but many other apparently more “significant” sites in the region had to wait and indeed many still do. I say “Classical” but this site is badged via its OUV very much as a “Lycian” site albeit, inevitably, with significant Hellenistic and Roman aspects which resulted from its location, its conquest over the centuries and the process by which the Lycians “assimilated” Greek culture. Heroditus said that the Lycians came originally from Crete but it is thought more likely now that they were an Anatolian people and that this explains the existence of their own very different language and script. A further important event in the site’s history was its conquest by the Persians around 540BC which provided yet another cultural infusion. Xanthos-Letoon thus hovers between being “yet another” Classical site and being something more uniquely “Anatolian”. As you visit you will see the standard Agora, Roman amphitheatres, Nymphaeum, Temples to Apollo etc as well as some remains of Byzantine churches but there are also many aspects which are uniquely Lycian. And even the Hellenistic/Roman aspects often overlay earlier Anatolian remains/beliefs. Thus, one of the main “claims to fame” of the sites has been the light that excavations there have shone on the Lycians – particularly through the discovery at both Xanthos and Letoon of bi and tri lingual texts which have assisted an understanding of Lycian (and another Anatolian language called Milyan). The other more infamous claim has been the removal from (some might say “plundering of”!) Xanthos in the 19th C, by British “explorer” Sir Charles Fellows. in particular the Nereid Monument and the Tomb of Payava which are now on display at the British Museum. When visiting Xanthos it thus seems worth concentrating on the Lycian aspects, whilst taking in the rest en passant. The site is divided into 2 unequal parts by a paved road which runs through it. As you climb the road from the village of Kinik you approach the car park and entrance on the right but, just before hand on the left, is a small sector based on the original Lycian acropolis (as the AB review states “remodeled during the Hellenistic and Byzantine periods”). This contains a large part of the site’s interest - in particular the Harpy tomb (left by Fellows but only after taking its friezes, for which modern reproduction casts have been provided! Photo Right), another Lycian tomb and a bilingual carving from 425BC and said to be the longest known in the Lycian language. The Agora and Theatre are also situated there. If you have walked up from the village you might get to see these without paying your 10TL entrance fee but I suspect that the peripatetic guardian will catch you! To reach the other main attraction you need to pass the entrance booth and walk to the Necropolis. This is a pleasant stroll through countryside and you will probably come across wild tortoises. Down to the right is where the Nereid monument was once situated (this is marked on the site map at the entrance) - the remains of its base are still visible. Not much else seemed of note from among the Hellenistic/Roman ruins. The Necropolis is round the corner and you will probably have it to yourself. Xanthos isn’t as much on the coach tour trail as many other sites but, whilst we were there, did receive a steady stream of minibus groups from coastal resorts – these seemed to concentrate on the smaller part of the site as already described. The Necropolis is large and contains some fine tombs :- both separate structures in the Lycian style based on what was presumably an earlier “model” of large “Woooden” carved sarcophagi but also carved as caves into the living rock with pillars and decorations at the entrance. In all honesty we saw more elaborately and interestingly situated cave tombs at another Lycian site – Tlos. Unless you are particularly interested or wish to fill a day I would have thought that 1+hr was ample for the site. Which takes us to The Letoon – I note that no one else has as yet reviewed it. The AB puts it at 5 miles and Google Maps at 6kms away from Xanthos. I found it a dispiriting place. The AB review talks of the problem of rising groundwater and indeed the site contains a fetid pool and some areas which, I suspect could get very muddy after rain. The main sights are the bases of 3 monuments – to Apollo, Artemis and Leto. But, above these bases, little remains. The entire ensemble was built as a sanctuary to Leto by the Greeks from 4th C BC but had earlier origins related to the Lycian mother goddess. I won’t go into Leto’s full mythological genealogy other than to say that Zeus fathered her twins Apollo and Artemis – hence the trio of monuments. The site also contains a Nymphaeum, whose extant remains (only!) date back to Hadrian and which is now partly underwater with a few pillars sticking up (it was the original source of the sacred spring around which the original Letoon was built), from a lake populated by terrapins and frogs said to be shepherds transformed by Leto’s vengeance! There is also a theatre from 2nd C BC which was used for religious performances (there is no evidence of any Lycian housing at Letoon) and the remains of a Byzantine church – the sanctuary continued in use through Roman times and was later transformed into a Christian site. The site’s particular claim to fame lies in the discovery there in 1973 of the “Letoon Trilingual Stele”. Apparently this is often titled “The Xanthos Trilingual” to distinguish it from the “Xanthos Bilingual” referred to above and which still resides at Xanthos. But the Trilingual is in the Fethiye Museum (we didn’t see it) and what remains at Letoon hardly seems worth bothering to go and see – particularly as the Xanthos ticket isn’t valid there and you will have to pay a further 8TL to get in! The site is quite small and hemmed in by agricultural enterprises – way back in 1988 the AB evaluation referred to the “recent appearance on the landscape of many greenhouses for tomato growing” and questioned the smallness of the inscribed area. Things must have worsened over the years – the view across the valley from the heights of Xanthos are of a “lake” of shimmering plastic structure erected so close to each other that, in many areas, no “land” can be seen! So a question arises – why in 1988 did Turkey decide to add Letoon to the Xanthos nomination and why did ICOMOS, despite its reservations about its condition, agree? Was it really justified as an essential part of the Xanthos OUV? Turkey’s T List from this era contained 2 Lycian sites and that for Xanthos stood alone with no mention of Letoon. The other T List entry at the time was “Lycian Rock cut tombs in Myra – Limyra 6th – 4th C BC”. Myra and Limyra were 2 Lycian cities both of which appear to be included within Turkey’s current T List site titled “The Ancient Cities of Lycian Civilisation” added in 2009. Xanthos is also listed in this latest entry (but not Letoon)! As indicated above, Letoon is relatively close to Xanthos and is situated in the valley of the Xanthe River - but I haven’t been able to discover that the Sanctuary was particularly closely or uniquely “linked” to that city but was rather a general cultic site for the civilization as a whole (though one article suggested that it was “run” from Xanthos –but without evidence). A notice board at the site states “The Letoon was the religious centre of the Lycian League” with no mention of a connection specifically to Xanthos. The remains of the important Lycian port of Patara are only around 20kms from Letoon and it is described in the current T List entry of which it is a part, as the “Capital of Lycia”. This is also somewhat surprising as the Xanthos inscription assigns that honour to Xanthos! In fact, Lycia was run as a federation (“League”) and 6 of the largest cities, including both Xanthos and Patara, had an equal 3 votes as the most important ones (others had 2 or 1 vote), so the entire concept of a single “Capital” may be invalid. The AB evaluation asserts “Xanthos, the capital of ancient Lycia, and the neighboring and indissociable site of Letoon located five miles away form a famous archaeological complex” - but provides no supporting evidence of the “dissociability” or the concept of a single “complex” of 2 elements separated by that distance. It also refers to “The rich series of Lycian tombs at Xanthos and Letoon” – but in fact there are no Lycian tombs at Letoon! The 2 elements of the nomination give the impression of having been banged together at a late stage – but, at whose initiative isn’t clear. Another interesting issue for the future is what would happen to this inscription if Turkey ever progresses the T List “Lycian Cities” nomination? Would it remain separate, in which case Xanthos would be inscribed twice- both times as a “Lycian city”? But. On the other hand Letoon isn’t a “city”. Or would the 2 be amalgamated? If our visit to the Lycian city of Tlos is anything to go by the T List site contains some very worthy entries and could easily justify inscription. My preference would be for Xanthos to be incorporated into a wider inscription including several examples of Lycian cities with, or without, Letoon as a common religious location. Last November I caught the bus in Antalya with the intention to go to Patra, and explore the UNESCO sites. The bus driver knew I was getting off in Patra, so sure enough his shouting at me made me aware that this was the stop--with a sign that read 6 km. to Patra. I had not gone 300 yards before I was offered a ride to my hotel. This time of year there are no buses to the sites, so I started back down the road to the highway, and once again secured a bit of seat on the back of a motorcycle, that took me to Xanthos. If you are an ancient Greek " junkie," the site is breathtaking, and in November you have it all to yourself save for a few goats, and the mandatory dog that goes everywhere with you. I new a good bit of the grim history of this site, and it all made it more moving. Its a perfect place for reflecting on the history of those times, without the pressure of crowds. Caught a bus back to the intersection to Patra, and once again was provided a ride by these gracious people. It was apparently olive picking season, so back at my hotel I joined in on pitting olives. Xanthos was besieged and occupied by the Persians, the Greeks, the Romans and the Byzantinians and has some nice excavations, mostly done by French archeologists since 1950.But important structures like the fabulous Neired monument have been kidnapped to the British museum in London and Xanthos is left with bare rocks.The large amphitheater is a wonderful building and well worth the visit in its own. Transportation to Xanthos is easy, with local minibuses leaving to and from Fethiye and Kalkan hourly to the village of Kinik.From there its a 1.5km walk uphill. 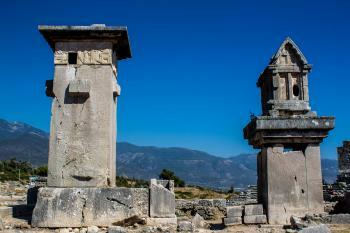 I visited Xanthos on 11.10.03 by taxi from Patara together with 2 other hotel guests. The site was virtually deserted and we spent a fascinating 3 hours exploring it. The entrance fee was about £ 2.50 and well worth it. The rock tombs were the most impressive for me as I had never seen one close up and here were lots all over the hillside.A helpful Turk was very good at explaning what we were looking at and pointing out particular features which we would have missed had he not been there. He was not intrusive like the Egyptians are in Luxor and was well worth his tip. Patara a few miles away is absolutely fescinating and again almost deserted in early October. I spent hours exploring the various buildings with the aid of a book written in 2000 by Prof.Dr. Fahiri Isik who is excavating the site. I have hundreds of fantastic photos to refresh my memories of the area and hope to visit again. Stelae: Xanthian Obelisk, an important archaeological find pertaining to the Lycian language. Ongoing Archaeological digs: University Laval Quebec (Canadian Epigraphic Mission) Reports up to 2010.